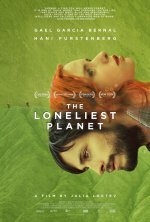 The Loneliest Planet release date was Friday, October 26, 2012. This was a Limited in theaters release. Alex (Gael Garcia Bernal) and Nica (Hani Furstenberg) are young, in love and engaged to be married. The summer before their wedding, they are backpacking in the Caucasus Mountains in Georgia. The couple hire a local guide to lead them on a camping trek, and the three set off into a stunning wilderness, a landscape that is both overwhelmingly open and frighteningly closed. Walking for hours, they trade anecdotes, play games to pass the time of moving through space. And then, a momentary misstep, a gesture that takes only two or three seconds, a gesture that's over almost as soon as it begins. But once it is done, it can't be undone. Once it is done, it threatens to undo everything the couple believed about each other and about themselves.